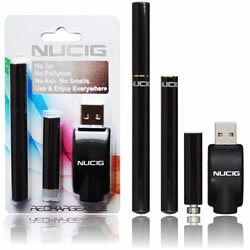 Black electronic cigarette mini kit buy from NUCIG UK. These electric cigarettes are a life saver. They are much smaller and less noticeable than vapes and emit very little visible smoke while keeping the user happy. Works well. Lots of filters to choose from which is good. As a new user i wanted a simple to use kit. This is very good, filters easy to exchange when they expire and easy to recharge battery. It's a good product for an e-cig beginner.